In getting my ongoing python CSG library functioning, I needed a way to compile and build python extension modules. Typically I use qmake from the QT library to build projects, as it's relatively cross-platform (Xcode support is broken as of version 4+) and has relatively little magic sauce making it function (I like transparency in a build system). However, this isn't so hot for python modules where it's nice to have a simple setup.py script that compiles and installs your module. Distutils provides just this functionality, while being pretty easy to pick up. So I decided to do the building with distutils. Then you have to choose how to actually generate the wrapper code. Doing this by hand using the python API is manageable but cumbersome and results in a lot more code to maintain. To improve this, there are a number of other wrapper code generators, including SWIG and boost::python. I prefer boost::python because it i) is very explicit, you define the exposed interface directly and ii) works with all compilers, without custom build steps or interface file compilation. It's a bit more typing than SWIG, but I (again) like the transparency. Of course the downside to boost::python is bjam, the boost build system that appears to summon demons from the ether to build your project through sorcery. Most tutorials assume you will use bjam but I have yet to get it to work on an even modestly complicated project. So I set about building python modules wrapped by boost::python using Distutils. This is actually pretty easy, but I had to dig around through forums and documentation to find out how. Consequently I decided to post a full example from start to finish. This file calls a bunch of boost::python macros which instantiate the wrapper code, including handling default arguments for functions and overloaded constructors for classes. It is also possible to do function overloading, although I've left this out for simplicity. Note that there's nothing specific about the filenames I chose, as long as the functions and classes to be wrapped are included in the wrapper source code file, you can use any structure/names you want. When boost_python_wrapper.cpp, functions_to_wrap.cpp and classes_to_wrap.cpp are compiled as a shared library, boost::python will generate wrapper automatically generate wrapper code inside of classes_to_wrap.cpp by macro-expansion, so no additional source files are needed. Just link the results with the python and boost::python libraries and you get a python module. Distutils provides a clean way of doing this and installing the module automatically. To make a build/install script, we create a script setup.py in the root directory. The contents of this script are little more than compiler and linker flags. # '/usr/local/include', hence the corresponding entry. Note that the include and library paths are most likely included by default. I have added them simply to demonstrate how you would include (potentially custom) headers and libraries into the build process without overcomplicating the example. If you run this script you should see the expected output from the script (evident from the script itself). You can download the entire example as a zip file here which includes all the source/header files as well as the build scripts and a readme. Hopefully it will be helpful to other people, or just me later on. As mention in a previous post, I've started work on a Constructive Solid Geometry (CSG) library. The library is currently written in C++ and uses Carve to do the heavy lifting. I am also planning a CGAL back-end since so far, it seems more robust than Carve to geometric degeneracies. Unfortunately, lack of strict compliance to the IEE754 spec by the LLVM and Clang compilers means that I can't develop and test this under OS-X 10.7, my primary development machine. The ultimate goal is a simple, easy to use library with functionality akin to OpenSCAD, but usable from mainstream languages (C++ and Python). I currently have a basic implementation functional, including mesh loading and saving (.OFF, .OBJ and .STL), affine transformations, basic primitives and CSG operations union, difference, symmetric difference, and intersection. All of this functionality is available through python via a BOOST.python wrapper. 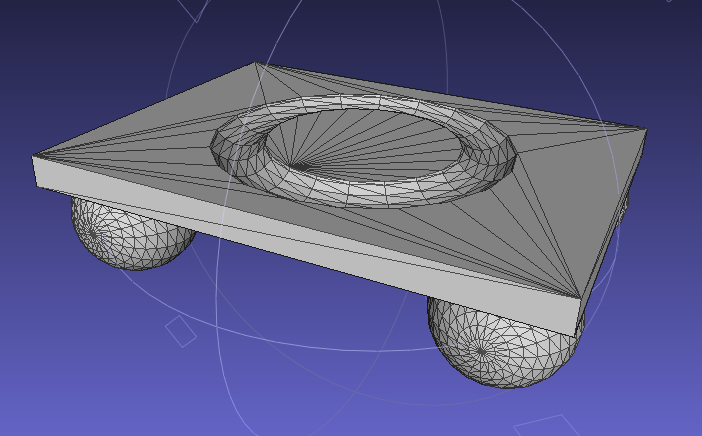 Note that this is a single watertight mesh suitable for 3D printing, machining or meshing for finite element analysis. I'm still finalizing the API, but will release the code when it's a bit more stable which I hope will make parametric design and optimization much more practical with open source tools. I've found myself redoing this code relatively frequently, so I thought I would post it. Nothing special, just a snippet that loads the file input.obj, builds a CGAL::Polyhedron_3 from it, and writes it out as dump.off. The code also includes a rudimentary Wavefront OBJ loader. // A modifier creating a triangle with the incremental builder. // barebones .OFF file reader, throws away texture coordinates, normals, etc. It's pretty difficult to find reasonably priced gears around and even if you can find them, they're often not exactly what you want. Finding a gear with the right number of teeth, width, pressure-angle and bore is often not possible. To this end I have written a python script for generating involute gears. Other scripts are available, an OpenSCAD script thingiverse for example, however i) I like to do things myself, from scratch and ii) I'd prefer my setup work with a more mainstream programming language. The source-code is available at the bottom of this post. The script generates involute spur gears, with pressure angles up to about 30 degrees. I hope to extend it to include racks and internal gears eventually, but it is quite useful now. Output is in SVG for easy editing in graphic-design/laser-cutting or DXF for use with OpenSCAD. I am currently working on a CGAL-based constructive solid geometry module for python that will allow CSG operations to be performed by python scripts. This would allow fully parameteric CSG design to be done in an open, mainstream language. These parts will eventually be used as part of a 1:4 drive for the leadscrews for my CNC. Currently I have ample torque, but cannot spin the motors fast enough to get fast rapid traversals. With a 1:4 drive, I will hopefully be able to drive the machine quite quickly. Sourcecode for the script can be downloaded from: http://sites.google.com/site/jamesgregson/tmp/gears.py. Use it for whatever you'd like, but please don't redistribute it. Stochastic Tomography paper accepted to SIGGRAPH! The paper presents a new method for tomographic reconstruction based on a point-sampling process similar to the Metropolis-Hastings algorithm. In the paper this is applied to building reconstructions of a fluorescent dye mixing with alcohol from multi-view video. The algorithm is well suited to this task since it allows arbitrary projections and is naturally adaptive. It is also very straightforward to incorporate effectively any regularizer into the algorithm, allowing application specific prior-knowledge to be exploited during the reconstruction process. I hope to post a bit more about the hardware setup that is used for this project in the new week or so.